We want you to be able to experience some of the best products in our line. That's why Jane put this 'Tasting Menu" together. Dip in, play, experiment. There's nothing more fun than makeup, especially when you know it's good for your skin. includes six key products that can complete your look in a few simple steps. 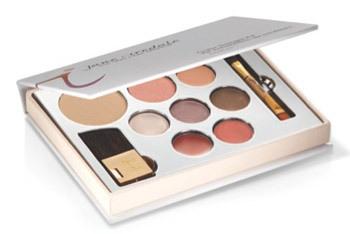 jane iredale's most popular multi-tasking foundation, concealer, powder & broadspectrum sunscreen all-in-one. A weightless base that gives a sheer and semi-matte coverage. Formulated with nourishing minerals and free from chemical dyes and irritating ingredients, this blush provides a soft wash of just-blushed colour. A luxe eye conditioner and concealer containing moringa butter, avocado oil and green tea extract. Perfect for dark under-eye circles. Our highly pigmented shadows are simple to blend, sensitivity-tested and they stay put for gorgeous, crease-free, long-lasting eye colour. Each kit contains a base, medium and accent shade that can be used along or combined to create any desired look. A creamy, rich and smooth formula that glides on easily for long-lasting colour. Formulated with a luxurious blend of pure ingredients like moringa oil, orange peel wax, avocado and sunflower seed oils, Vitamin A & C, coffee seed extract and organic pomegranate and blackberry fruit extracts. Delicious! Soothe, hydrate and nourish your lips with a lip gloss formula packed with state-ofthe art ingredients like moringa butter, lotus flower extract, avocado oil, sunflower seed oil, pomegranate extract and Orange Peel Wax. Remarkably long-lasting and free of petroleum-based ingredients. Use the natural hair end for eye shadows and the taklon nylon (orange) end for concealer, lip stick and lip gloss. We know you'll enjoy trying these beautiful products. You can count on us to give you the highest quality and the purest ingredients possible. Enjoy!